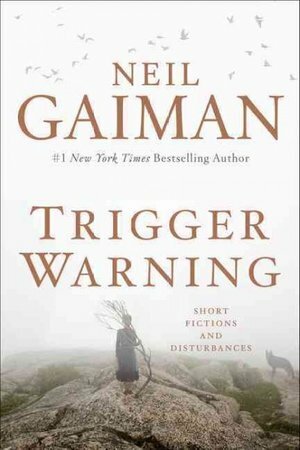 With Neil Gaiman’s Trigger Warning: Short Stories and Disturbances, the author has given us an assorted collection of short stories with a dabble of poetry. In this collection of horror, sci-fi, and fantasy, you can learn about a mysterious American traveler who visits a quaint English town with dark secrets, solve a peculiar mystery with Sherlock Holmes, meet an odd man who claims to have uninvented the jetpack, and even defeat aliens with the eleventh Doctor. Neil Gaiman is a New York Times #1 bestselling author who has written wide range of books for children and for adults. This collection of short stories is the third published by Gaiman, following Smoke and Mirrors: Short Fictions and Illustrations (1998) and Fragile Things: Short Fictions and Wonders (2006). Considering how well these past collections were received and how well I believe this one did, Trigger Warning very likely won’t be the last of them. While I enjoyed getting to know further detail about each story than is normally given, I’m not sure the preface was the best placement of them. I felt obligated to go through and read about each story before starting them which took away, only slightly, from the magic of blindly discovering excellent short stories within a collection. I found myself turning back to the beginning to read some of the explanations again once finishing the stories. Gaiman plays with format in many of his stories, the most noticeable being “Orange.” Under the title of the story there is a note which states “(Third Subject’s Responses to Investigator’s Written Questionnaire.) EYES ONLY.” The story is written as a numbered list of answers without the questions that prompted them and yet, it is still easy for the readers to completely grasp the story because where there are vague answers such as “several times a day” there are more descriptive answers such as the description of where the narrator found “an empty jam jar” under her sister Nerys’ window. This story with the odd format ended up being one of my personal favorites in the collection due to the amazing and interesting way it was told through only a long list. The best part was that the narrator almost seemed bored as she was answering the questions about her sister turning into an entity known as “Her Immanence.” Another story that was interesting format was “A Calendar of Tales” which combined 12 short stories into one, each story representing a month of the year. Every small story within this larger one was written expertly, however each of them ended on a cliffhanger that left me gripping to the last sentence hoping the next story would expand upon the previous one. They never did. Gaiman did a wonderful job of creating twenty-four (well, actually thirty-five considering “A Calendar of Tales”) different worlds with spectacular imagery which assists the readers in truly experiencing the stories. In “Down to a Sunless Sea,” Gaiman introduces a woman who “does not appear to care about the rain” by writing the story in second person telling us that we “want to pull [a bone necklace] from her neck, to toss it into the river for the mudlarks to find or to lose.” Some of the other worlds presented to the readers were familiar, at least in my case, as I got to visit London and India with the famous Sherlock Holmes in “A Case of Death and Honey,” a story which reimagined the reason he has been a character who has been revived many times since his original death by Arthur Conan Doyle in 1893. I also got to travel to the year 1984 with the eleventh Doctor and his companion Amy, and being a huge Doctor Who fan myself, I enjoyed getting to be with those characters again on a new adventure. I also got to visit worlds that were familiar, but not quite the ones I knew. In “The Sleeper and the Spindle,” we learn about a different version of sleeping beauty with another fairytale princess, now queen, being the fierce heroine of the story. Being that Neil Gaiman is a spectacular writer, all of his stories and poems, at least in this collection, are written to represent that. While not all of these stories may immediately seem enchanting, they are well worth the read. The fun thing about short story collections is that there is no necessity to read each story in the order that they are printed. You can read the stories front to back, back to front, or in any order that pleases you. You can even go back and reread your favorites, as I did. If you’re looking for creative intelligence that fuels a random assortment of fun, creepy, and interesting stories, this is the book for you. About the Author of this Post: Kate Haley is a sophomore at North Central College where she studies English Writing and Organizational Communication. When she is not spouting off random facts about anything and everything, she fills her time with reading copious amounts of books and writing novels that will hopefully become best-sellers (or at the best, sellers).